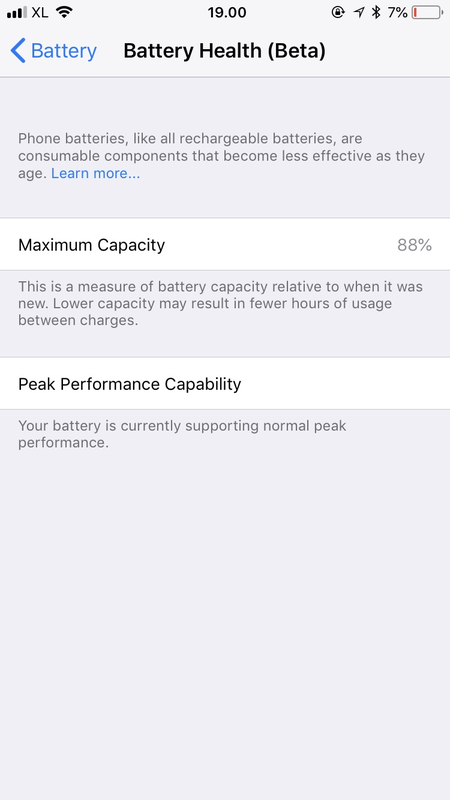 My iphone 7 (around 1 year) has only 88% battery max capacity. Is it normal ? Ps : there’s no battery health for ipad air (1) ? Re: Do you think it’s normal ? There’s no battery health for a 2017 iPad ! It does also lists this as 'Beta', no? Thus maybe the statistics are not accurate. Merely my opinion. I just checked mine (iPhone X), and it shows 100%, with current battery at 98%. Suggestion, check it again, after a full charge. I'd say that's normal. My 7 Plus (brand new at launch) is currently at 99% charge and battery health is showing 89%. I'll accept that as I use it heavily and it's almost 2 years old. Very possible. I normally don't charge mine during the day unless I hit 10% battery. I will use mine for GPS for short trips (30 ish minutes) but anything longer and I use a GPS unit. I do stream Apple Music anytime I'm in the car. My wife’s 7 plus battery started acting terribly once it started reporting 86% battery life. Apple said that it should still be acting normal but battery life would be affected because that means that only 86% of the cells are taking a charge now. When I had my 6plus i kept it charging in my phone all the time during the day and then all night as well and it still showed 98% after almost 5 years of usage. Might not be a bad idea to look into a battery replacement before Apple drops the promo if you plan on keeping it long term. $29 is pretty cheap considering I can change them myself for around $15 but risk damaging the battery getting it out. FYI, battery health is out of beta in the iOS 12 latest beta so expect that when iOS 12 drops to the public.